Brig. Gen. Phil Purcell, commander of the 162nd Wing, left, passes the 214th Reconnaissance Group guideon to Col. James Thompson as a symbol of his assumption of command at Davis-Monthan Air Force Base July 9. Thompson's previously served as the vice commander of the 9th Air Expeditionary Task Force in Afghanistan. Now, as the top officer for the 214th Reconnaissance Group, he will lead a unit that provides highly sought intelligence, surveillance and reconnaissance capabilities to warfighters abroad 24 hours a day, every day. 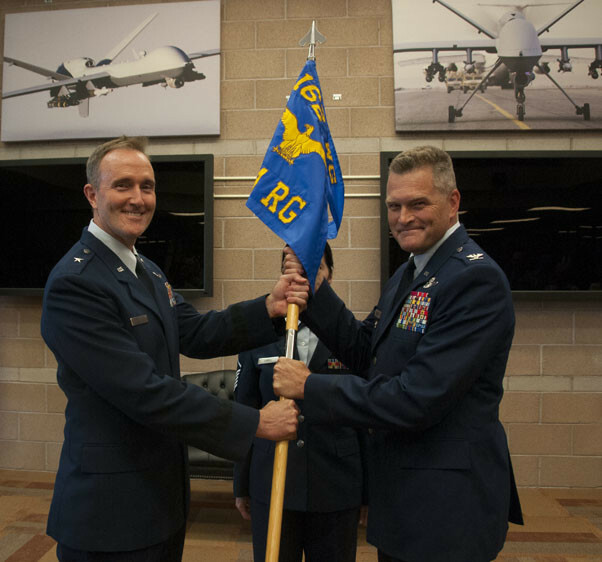 TUCSON, Ariz. — A former vice commander for the 9th Air Expeditionary Task Force in Afghanistan assumed command of the 214th Reconnaissance Group at Davis-Monthan Air Force Base July 9. Col. James Thompson, an Arizona native who returns home after 22 years of active duty service, took over from Lt.
Col. Brian Grasky, who served as the interim commander for the group and will now be its Operations Support Squadron Commander. 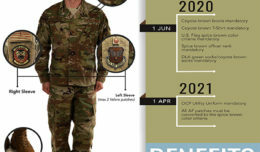 The primary mission of the 214th RG is to fly overseas intelligence, surveillance, and reconnaissance missions using the MQ-1 Predator in support of combatant commander priorities. The unit flies operations 24 hours a day, every day. “We stand at a benchmark point of the RPA (remotely piloted aircraft) enterprise and for the wing,” said Brig. Gen.
Purcell added that while Thompson’s technical background was impressive, it was his “commitment, confidence and character that can’t be deciphered from a piece of paper” that paved the way for him to be the top officer of the nearly decade-old group. Airmen, friends and family were on hand to witness the time-honored ceremony, complete with the symbolic passing of a unit guideon between commanders. 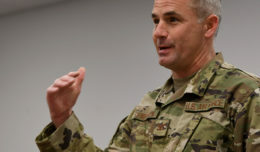 During his speech, Thompson highlighted the forward-thinking mentality that he hopes will be the standard for the more than 170 Airmen serving under his command, expressing an excitement about the future of the platform. Thompson’s new assignment comes amid high-demand from overseas commanders for persistent intelligence, surveillance and reconnaissance capabilities. The unit’s presence extends southward to a newly established Launch and Recovery Element (LRE) in Ft. Huachuca, Sierra Vista, Arizona, which trains pilots and sensor operators to take off and land the aircraft. 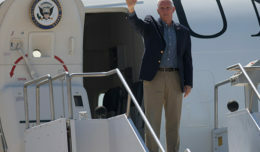 In addition to the unit’s combat responsibilities in the theater of operations, the Airmen and aircraft at the LRE may be called on to support the governor in a variety of scenarios, like providing wildfire imagery or search and rescue. Thompson, a distinguished graduate of the U.S. Air Force Academy and command pilot with over 2,500 hours of flight time in six separate airframes, highlighted the relevance of the unit’s mission, pointing to an incident earlier this year in Kabul, when an improvised explosive device killed scores of Afghan nationals within miles of his position. The ceremony comes during the 20th anniversary of the U.S. Air Force’s designation as the operating service for the multi-role system, and plans to transition from the MQ-1 Predator to the MQ-9 Reaper. In closing, Thompson reminded the audience that maintaining and operating an RPA mission is more than just tending to pilots and sensor operators. In a separate interview, Thompson offered a guiding principle for his Airmen. He also made them a promise of action and transparency for his tenure at the 162nd Wing.